In order to be able to identify and, in a second step, describe a process of acculturation, one must be able to sharply delimit and distinguish the different cultures involved as identity groups. In Lycia, an area of Asia Minor, we seem to find excellent preconditions for a study of acculturation processes since the epichoric Lycian culture is quite distinct. In its funerary architecture, language, and political organisation, the region between ancient Telmessos and Cape Gelidonya shows a very specific configuration already in the Archaic period. If one seeks to trace this is detail, however, one is soon faced with a variety of hurdles that need to be overcome. The specifics of Lycian culture, especially of its political constitution, are largely obscure, although we do hear of ruling dynasts. The archaeological remains that show a distinct, genuinely Lycian style, date from the 5th and 4th century BCE and thus from a period dominated by Greek and Persian influences. 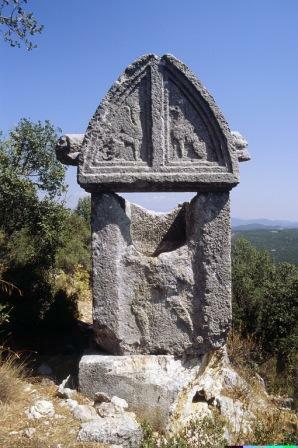 In consequence, the period for which we have good material is also a time in which the process of acculturation is already quite advanced; it may well be that the increase in Lycian rock-cut tombs, and thus the increasing occurrence of a specifically Lycian architectural form, is in part a result of this process. Both the ethnogenesis itself and the monumental articulation of an identity therefore appear as the result of a process of acculturation. Harbour towns are of pivotal importance in the study of these processes. Although it may be considered a hallmark of Lycian settlements of the Archaic and Classical periods that they are, with few exceptions, situated on easily fortifiable and inaccessible hilltops, this changes from the late 5th century BCE onwards and increasingly the core settlement areas shift towards the sea. Near modern Fethiye, for instance, a mountain settlement was abandoned and the associated coastal settlement, the Greek polis Telmessos, became the new centre. Phellos and Antiphellos, as well as Apollonia and Aperlai in Central Lycia show similar developments. Whereas the inland settlements stagnate in their development, the harbour towns experienced a boost in prosperity visible in their public buildings. They become independent poleis and show a far more hellenised face to the world than the older mountain settlements in the back country. It is surely not coincidence that the pioneering role of harbour towns in processes of acculturation is a topos of the ancient literary tradition, which routinely treated them as the most progressive type of settlement. This process is seen as both good and bad: on the one hand, foreign cultural influence is presented as threatening to the community. On the other hand, harbour towns and their creation figure as a markers of a pan-Hellenic process of civilisation: Abandoning the safe but underdeveloped mountains in favour of the coast allowed the Greeks to attain the level of culture that provided the essence of their identity. The details of these supposed processes of acculturation are unclear. The project's aim is to gain a better understanding of them by tracing developments in focused case studies that will aim to touch upon as many cultural areas as possible, including settlement and economic structure, political constitution, and architecture. The study will hence focus on two pairs of settlements (Teimiusa and Tyberissos, Phellos and Antiphellos) that promise a broad range of insights into such processes. Each pair consists of a harbour town and a site in an extreme topographical location in the back country, i.e. with disadvantages in matters of logistics. How did the harbours develop under the influence of an increasing volume of external contacts and how did their development affect the back country, especially the associated mountain settlement and the micro region? How did the processes of acculturation develop? Which cultural areas show their influence most strongly? What impact did the expansion of shipping, trade, and harbours have on the settlement structures and how strong was it? How did people respond to the new, highly connective settlement type? Are harbours generally considered the more attractive variant, or do alternatives remain popular?